OK, I don't like most superhero movies - they screw up the mythos so badly - but this is one of the best.The only other superhero movies I like are Spider-Man, Spider-Man II and X - Men I. Oh yeah, and Fantastic Four II. 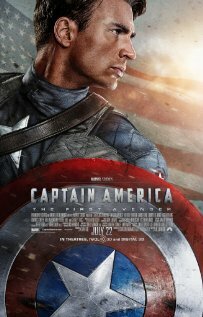 It faithfully follows the story of the skinny but brave geek who hates bullies and gets injected with the super soldier serum and becomes Captain America. It shows his path from a guy who wants to fight the Nazis but becomes a stupid propaganda tool instead, appearing in chorus shows, to going out on his own to rescue captured troops without orders. Awesome. Chris Evans, Johnny Storm from the Fantastic Four movies, plays Cap beautifully. Hugo Weaving, Agent Smith from The Matrix, as the Red Skull- also masterful. I also like Tommy Lee Jones as the Colonel, and Stanley Tucci who plays Dr Erskine. Great acting all around in this film. The flagpole scene shows the skinny kid is highly intelligent, and the grenade scene establishes his bravery. Great set-up for the future superhero. All he needs is a body to match his spirit. And of course he gets one, courtesy Dr Erskine. Why did Erskine choose the skinny kid? Because, the strong man, who has known power all his life, may lose respect for that power. The weak man knows compassion. With great power comes great responsibility you know. The first scene where cap chases a hydra spy right out of the lab where he just became a super soldier and leaps to stop him is truly thrilling. The Red Skull and Cosmic Cube-Icons of the Captain America world, were handled beautifully. No bogus Batman-like action scenes in this film. I also loved the scene where he picked out his shield-which we learn is made from Vibranium-a super hard super light element which absorbs vibrations. Comic afficianados will know this element comes from Wakanda, the Black Panther's kingdom. They may be upset, however to learn Cap's shield is made from Vibranium, as it's origin and composition were always kept a mystery in the comic books. I didn't have a problem with it. I did have a problem with agent Carter firing her gun at the shield and all the bullets dropped straight down to fall at Cap's feet-they did the same thing with superman getting shot in the eyeball and the bullet fell straight down (and no powder marks on his face!). Hollywood please listen-when a bullet bounces off something it careens like a half mile away into a tree or something. Simple physics, guys. I don't wanna have this conversation again. The love interest with the beautiful agent Carter is well handled-old fashioned, with no gross tongue-on-tongue makeout scenes. Their doomed romance is truly touching. Makes me wish I had a girlfriend lol. It also follows the Ultimates storyline of Cap being rescued from the ice then his waking up in the modern world. Sam Jackson as Nick Fury brings him up to speed. The tie-in scene with Iron Man II (Which sucked) showing the Stark Expo in real time was a clever addition. We see there a cameo of Dr Phineas Horton's 'synthetic man'-the original golden age Human Torch, in a glass display case. If the Avengers movie is anywhere near as good it's gonna be incredible kids. Oh yeah, Stan Lee makes his signature trademark cameo appearance. I won't say where. Man I love Stan Lee. He should have a show: 'Who Wants to Be a Superhero Artist? because I would be on that show, man.